Last week as Shell was getting ready to poke the first hole in the Chukchi Sea floor in Arctic Alaska to begin exploratory drilling, I was getting ready to give two talks in Alaska—the concluding lecture of the Next North Symposium at the Anchorage Museum on 9/8, and one at the Noel Wien Library in Fairbanks on 9/11 as part of the Northern Voices Speaker Series hosted by Northern Alaska Environmental Center in partnership with the Gwich’in Steering Committee. While there something remarkable happened over the weekend—perhaps the shortest–lived “beginning” of drilling anywhere. “Only a day after Shell Alaska began drilling a landmark offshore oil well in the Arctic, the company was forced on Monday to pull off the well in the face of an approaching ice pack. With the ice floe about 10 miles away, the Noble Discoverer drilling rig was disconnecting from its seafloor anchor Monday afternoon in the Chukchi Sea, about 70 miles from the northwest coast of Alaska,” the Los Angeles Times reported. There is much more to this story of ice and Shell. I was wrong. We didn’t need a foreign iceberg from Greenland. A homegrown ice floe—30 miles by 12 miles chunk of sea ice in the Chukchi Sea was enough to stop Shell on Monday. This year, the extent of Arctic summer sea ice hit lowest ever, breaking the previous 2007 record. “Scientists at the University of Colorado’s National Snow and Ice Data Center and NASA said that, as of Sunday [August 26], the Arctic sea ice cover had shrunk to 1.58 million square miles, the smallest area since satellite measurement began in 1979. With the melting season not yet over, the ice will almost certainly contract further in the coming weeks before it begins to re–form,” The Washington Post reported. Now comes the confusing news. In addition to Shell’s lack of preparedness, regulatory hurdles and protest from Iñupiat communities and environmental organizations, one more thing that delayed Shell’s drilling plan this year has been the enormous amount of sea ice in the subarctic Bering Sea, and in the Chukchi Sea to the north. Why are there so much sea ice in the Bering Sea and the large ice floe in the Chukchi Sea that stopped Shell? Surprisingly Republican lawmakers are yet to shout, “told you so, global warming is a hoax.” Let me explain. The Arctic sea ice indeed is melting at an unprecedented rate, reaching lowest ever this year, and is causing tremendous survival challenges for a host of ice–dependent marine species, including narwhal, polar bear, walrus, seals, and sea birds, and threatening coastal indigenous communities. While the circumpolar north as a whole is warming at a rate twice that of the rest of the planet, something regional is taking place now that has great consequences for Shell’s Arctic drilling. The reason Bering Sea and Chukchi Sea are experiencing extensive sea ice and some of its coldest temperatures in the past few years is due to a regional phenomenon called Pacific Decadal Oscillation (PDO). In 2010, writer Wendee Holtcamp accompanied scientists aboard the research vessel Thomas G. Thompson and wrote blog pieces for Nature about the Bering Sea Project, a multi–year multi–disciplinary partnership of the National Science Foundation and Alaska’s North Pacific Research Board to understand how climate change is affecting the Bering Sea ecosystem. Following year, in an article, “The Big Chill in the Bering Sea” Holtcamp wrote, “Research has shown that the Pacific Decadal Oscillation, a long–term atmospheric circulation pattern, is largely responsible for the Bering Sea’s recent temperature flip–flop, though other factors also play a role. Most people are familiar with the El Niño/Southern Oscillation (ENSO), which includes El Niño and La Niña, but the PDO differs in two ways. First, it typically operates on longer time scales, shifting every 20 to 30 years, rather than six to 18 months with El Niño.” If you look at the map from the US National Oceanic and Atmospheric Administration (NOAA) that accompanied her article you’ll see that we recently entered the cold phase of the PDO in the Bering Sea, meaning the next several decades the Bering Sea and the nearby Chukchi Sea will likely experience colder temperatures and more extensive sea ice. Time series of shifts in the phase of the Pacific Decadal Oscillation (PDO), from 1925 to 2010. Red bars indicate positive (warm) years; blue bars indicate negative (cool) years. Credit: NOAA PMEL. This is very bad news for Shell as it will likely threaten their drilling operation, again and again, with large ice floes, but it’s very good news for Arctic marine life struggling to survive in a melting north. In a recent article, “Arctic ice: Floes impeding Shell Oil hold promise for Pacific walrus,” Jill Burke wrote in Alaska Dispatch, “that floe and others are a welcome change for thousands of Pacific walrus, which made long and treacherous journeys to reach Alaska shores in recent autumns.… For the last three years in a row, and in 2007, the massive mammals blanketed beaches, sometimes with fatal consequences.… in 2009, when more than 100 walrus, mostly juveniles, were found dead after a large haul–out at Icy Cape, on the Arctic Ocean shore southwest of Barrow. And it’s thought that walrus have come ashore in increasingly large numbers recently after exhausting themselves in the search for sea ice on which they can rest and launch feeding forays into the rich waters of the Continental Shelf. A 2010 haul–out at Point Lay, not far from Icy Cape, was estimated to contain at least 10,000 animals.” Following year dead baby walruses were found on barrier islands off of Point Lay, along the Chukchi Sea. The federal government is currently evaluating whether walruses should be put on the Endangered Species List, but a decision is not expected till 2017. A decision on walrus should be higher priority than Shell poking holes in the Arctic seabed now. Why are we now sending Shell to get more oil that we will burn and send more CO2 in the air that will cause more arctic warming? In light of all the recent developments the Obama administration has an unique opportunity, a turning point—not grant Shell the final permit, but instead start work on a thorough Environmental Impact Statement, a requirement of the National Environmental Policy Act and something the administration has avoided so far. Such an extensive study could help us understand all aspects of both the melting of Arctic sea ice and the regional PDO, and the impacts these have on marine life and on the cultures of the indigenous communities. Before Shell kills the Arctic Ocean, the minimum we expect from our government is to delay Shell’s operations so that we have a better understanding of the rapidly changing northern habitat that our human and nonhuman neighbors call home. After my talk at the Anchorage Museum, the symposium ended with a magical performance by young Iñupiaq artist Allison Warden. 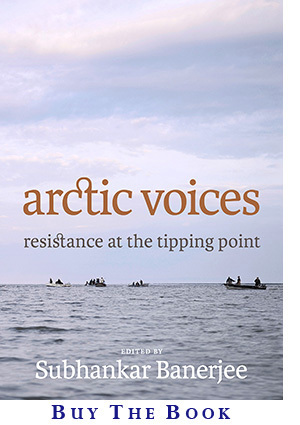 Her words, her voice, her performance transported us not to a romantic north, but the north now, a political north, in which caribou and polar bears are struggling to survive, in which we have an obligation to resist industrial destruction. As she was finishing, still part of the performance, she kept saying, “thank you,” “thank you,” to us in the audience for our part in helping to protect the north. Now, I’m relaying her message to you with the hope that you too will join in stopping Shell and industrial destruction of the Arctic.